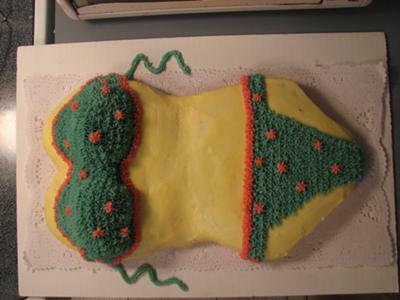 To make this bathing suit torso cake, start by baking two 9" cakes. When they are cooled, cut a small semi-circle out of one of the circles and place the other cake flush against it. This will give the appearance of them overlapping and will be where the waist of the cake is. Next, shape the torso out for a more hourglass figure (to your preference). Cut two semi-circles out of the sides of the bottom circle (this is the "hip" part of the torso). Also cut the top of the torso to resemble the top of a heart, this will be the cleavage.The last step is to use two small ball shaped cakes for the breasts or cupcakes could be used. Now time to ice the cake: do a crumb coat and refrigerate for approx 5 minutes and then smooth a layer of icing over the cake. With your color choice of icing, use a star tip to make the bikini and the blunt part of the tip to make an imprint for the belly button. Next, I used a rectangular strip tip for making the straps which where place directly on the cake board. I added a few extra stars in the contrasting color to add to the cake. This cake was a big hit with the crowd...very fun cake!